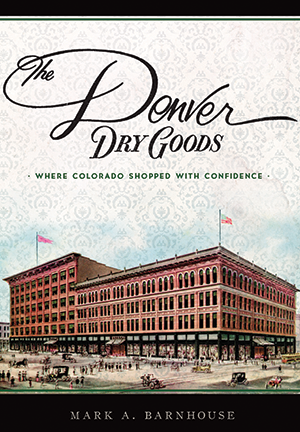 Over the course of eleven decades, The Denver Dry Goods and its predecessor, McNamara Dry Goods, proudly served Coloradoans, who knew they could "shop with confidence" for the best quality at the fairest prices. Much more than the goods it sold, the store was a major institution that touched the lives of nearly every Denverite. Comforting culinary traditions like Chicken à la King in the vast fifth-floor tearoom and breakfast with Santa delighted locals. Festive chandeliers adorned the four-hundred-foot-long main aisle during the holidays, and longtime salesclerks knew customers by name. Devoted patrons dearly missed all that charm after the doors closed in 1987. Mark Barnhouse explores the fascinating history and cherished memories of Denver's most beloved department store. Denver native Mark A. Barnhouse has published five history books on Denver and leads the popular Historic Sixteenth Street walking tour for the annual Doors Open Denver celebration. He earned his BA in history and English literature from the University of Colorado at Denver and has continued to research and write. Fascinated by the ways his city has changed over time, Mark is particularly interested in the histories of old, vanished department stores, having spent many hours in them as a youth.